We are the leading manufacturer of Decorative Head Light. We are offering JCB Head Lamp 3DX to our clients. H-4 ceramic lamp holder , fitted with brass clips and pure copper wire which make it highly durable. Mercedes car spare.Mercedes Benz E240 Light. 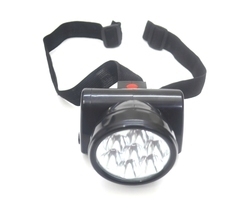 Our clients can avail from us Head Lamps that is extremely versatile, comes with a simple electronic push-button switch. These Head Lamps are known for its high quality. These products are available in market at competitive rates.